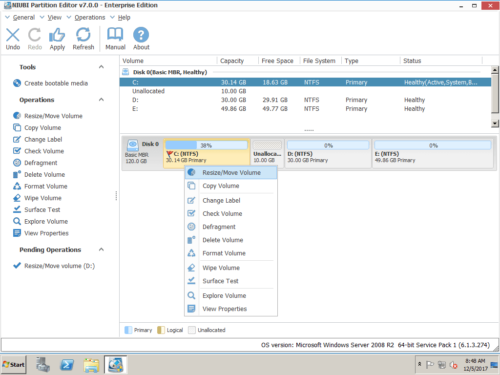 Windows Server 2008 R2 Extend Volume greyed out/disabled. 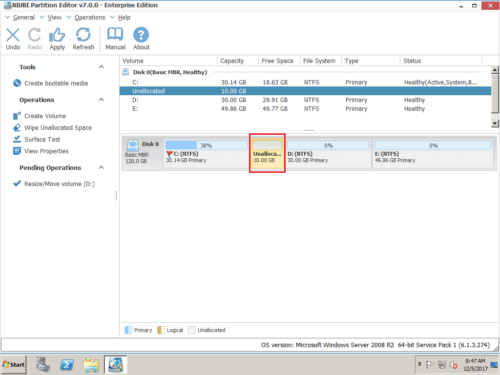 What to do when Extend Volume is greyed out/disabled in Windows Server 2008 (R2)? I am running out of space on my C drive, running Windows Server 2008 R2 in VMware. the option to extend C drive is greyed out, what to do? 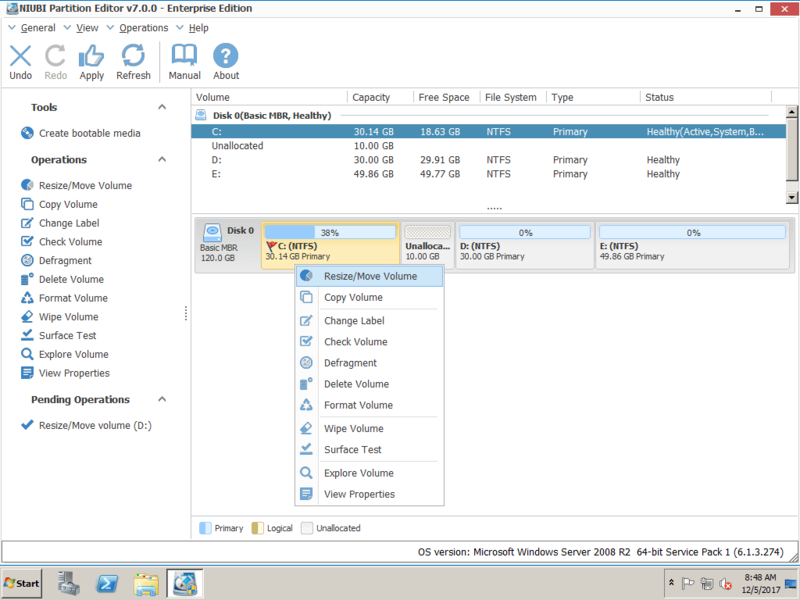 I am trying to enlarge an existing volume via DM on a Server 2008 R2 environment. 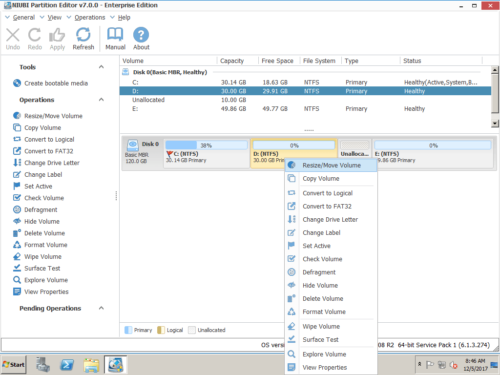 Disk management displays the unallocated directly behind the D: drive, but the Extend Volume is greyed out when I right-clicking C drive, anything wrong? In this article, I’ll show you why Extend Volume is grayed out in Server 2008 and give you the easiest solution to get out of this trouble. To better explain, please open Server 2008 Disk Management by clicking Server Manager > Storage > Disk Management. From this console, there are 4 drives in Disk 0: System Reserved, drive C, D and E. If you right click C drive, Extend Volume is greyed out. 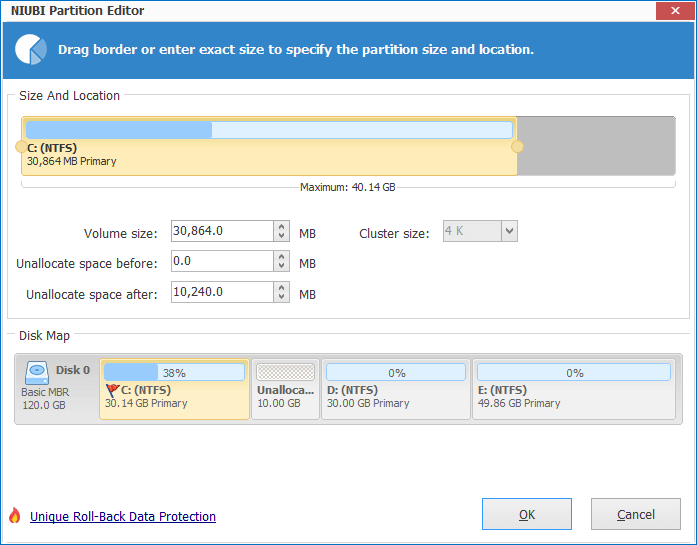 Try to decrease D drive with built-in Shrink Volume function. 10GB free space shrink from D.
Okay, delete drive D and retry. Now there is 40GB free space behind C drive, but Extend Volume is still unavailable. Now extend volume becomes available. The partition you want to expand is FAT32, only NTFS or RAW style partition can be extended. To extend C drive, there must be adjacent Unallocated space, so the Unallocated space shrank from D cannot be added into C drive. Only available option is deleting drive D, if D is in Extended Partition, you have to delete all volumes in this Extended Partition and the Extended Partition itself. The key limitation in Server 2008 Disk Management is that it cannot MOVE the Unallocated space, otherwise, this problem can be solved easily. To extend C drive, it is a BAD idea to delete D as well as all volumes in the adjacent Extended Partition. 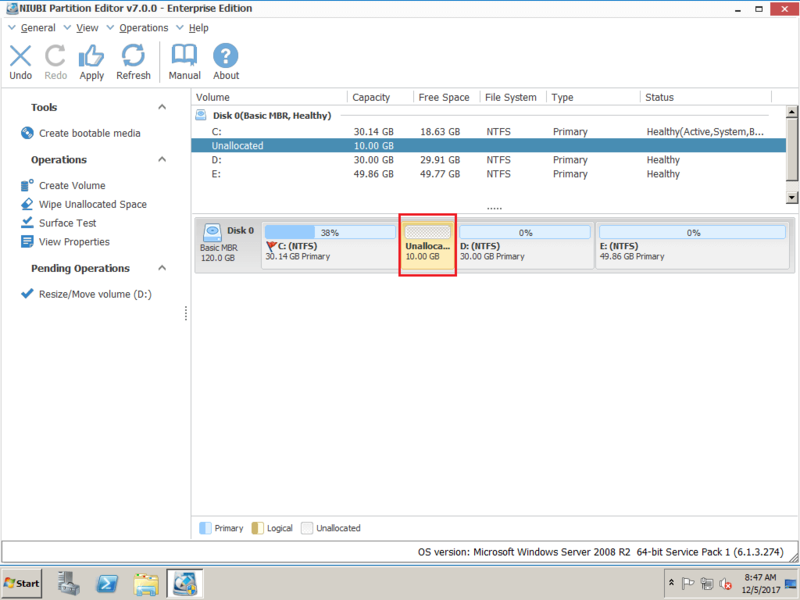 Step 1: Download and install NIUBI Partition Editor, right click drive D and select “Resize/Move Volume“. 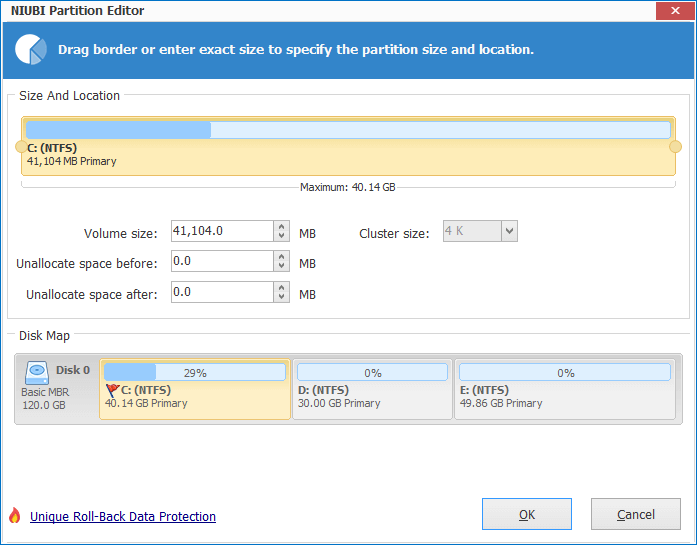 Step 2: In the pop-up window, drag middle position rightwards to move this partition. 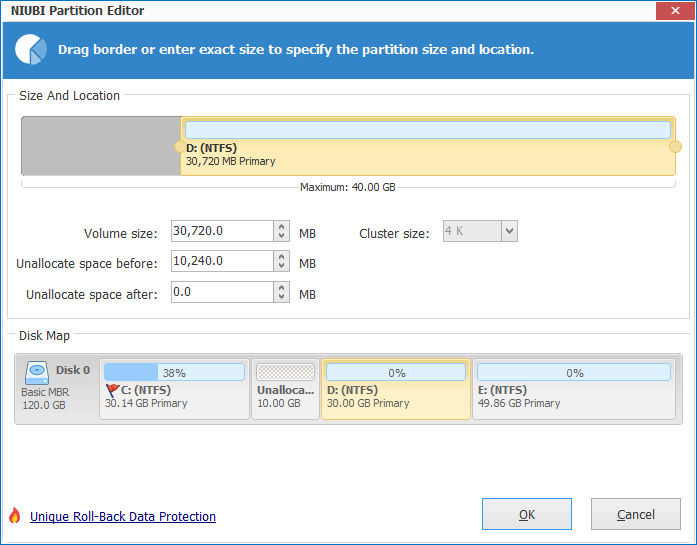 Click OK and back to the main window, where the 10GB Unallocated space moved to behind C: drive. Step 3: Right click C: drive and select “Resize/Move Volume” again. In the pop-up window, drag right border rightwards to hold the Unallocated space. Click OK and back to the main window, where C: drive increased to 40.14GB by holding the Unallocated space. Click Apply on top left to execute, done! Unallocated space can ONLY be generated behind the drive you shrank in Disk Management, but the partition software can generate before or behind this partition. Actually, if you use 3rd-party software to shrink and extend partition, it is much easier and you won’t see Extend Volume grayed out in Server 2008. 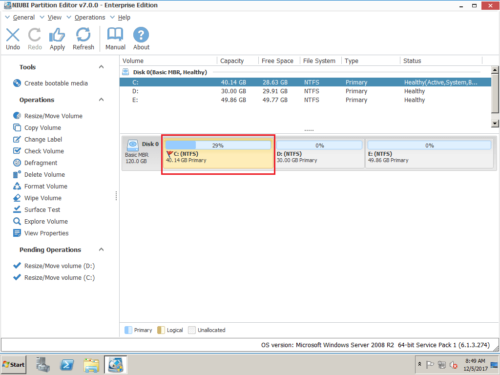 Extend Volume greyed out/disabled in Windows Server 2008 R2. © 2009-2019 NIUBI Technology ALL RIGHTS RESERVED. | Partition Magic ® is a registered trademark of Symantec Corporation.